Nov. 95 Web Watch in Popular Science Magazine. I'm Chelle (Machelle) Rogers and CASTALIA LLAMAS is my passion, joy and main business. I've been raising llamas since 1990 and brought an extensive background in training and owning horses to this enterprise. 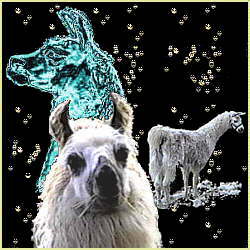 I have llamas for sale year-round and also provide breeding services to two fine studs (to approved females). We're located in the beautiful San Juan Islands of Washington state. The farm (tiny as it is) is 5 miles from the ferry dock in Friday Harbor on San Juan Island. We love visitors, but please email first for a rendezvous because my schedule is fairly hectic. Not everyone should own llamas. If you are fun-loving, sensitive, playful, patient, enjoy animals and nature, THEN llamas are probably for you. Whether you want a couple of geldings as pets or packers or for gathering wool OR a breeding quality 'bellringer' to improve your herd, I usually have someone available. If I don't have 'who' you need, I can probably steer you in the direction of someone who does. My geldings sell for $500.00, stud quality males and females are higher. I will not sell only one llama unless you have another at home. I feel we all need kindred spirits to be truly happy. My bloodlines include English, Canadian, Chilean and North American. If you know llamas, names like Union Jack, Macho Camacho, The Fiduciary, Legend's Rammas, Ivory Pond's Aladdin, Errol Flynn, Great Gildersleeve, Montesano, Pagliachi, Dr. DooLittle, Montezuma (the original) and Booker T. are probably familiar. My breeding goals are and have been for large, correct, genetically sound, fine fibered llamas with sweet dispositions. Many of my llamas come in the house and all born here are managable, gentle loveybears. All of my breeding stock sells with a guarantee and I'm always available for consultation. Llamas can be profitable as well as fun. My highest sale was $15,000.00 for 1/2 interest in a bred female. My highest cria (the proper name for those adorable baby llamas) sale at an auction was $18,750.00 for a 6 1/2 mo. old female weanling. My female sales normally range between $2,500.00 and $12,000.00. Stud quality males can run as high as females. HOWEVER, breeding livestock is a business that should be undertaken only if you have a sincere love of the animal. If you aren't interested in the day to day responsibilities of raising stock, buy and board (with other llamas) that special llama. WARNING: Llamas are addictive! Few people can stop with owning only one. Several people I know started out from the financial aspect of investing, fell in love with these magical creatures, bought a farm and live a very unique lifestyle now. If you melt a little with your first whiffle (llama kisses which are a gentle blowing in your face), it's probably too late to run, you're hooked. For others it's the gentle hum of a llama hello, or those long, silky eyelashes framing big, intelligent eyes. Some people's addiction starts when they see a group of crias bouncing around the pasture like Pepe Le Peu. (Remember that skunk who was always enamoured with a cat?) Most llamas do this charming ballet around dusk every night. Still others are impressed with the llama intelligence (they are smarter than dogs) or their aloof cat-like nature. And then there's the type who apprieciates a buddy who will hike all day and carry enough equipment and supplies for gourmet meals, a tent and whatever else would get left behind if the person were the only packer. Llamas have been recommended by psychologists and MD's as stress reducers for people with active lives. There is a something special about llamas, if you sit and just 'be' with a llama, you can't help getting caught in the magic. For thrill seekers, there's nothing to compare with showing your llama at one of the many llama shows and getting Grand Champion to make your heart beat fast. Some prefer the obstacle courses for performance llamas and many llamas enter both classes and costume class too! Then there's the cruisin' type who only go in for cart-trained llamas so their Sunday drives can be a little above average. Runners seem to enjoy the marathon races that benefit many worthwhile charities. Spinners seem more inclined to get hooked on that fabulous fiber, so sought after, that comes in a rainbow of colors, shades and types. Golfers think it's great fun to have a llama caddy. Many children are finding the joy of llamas through 4-H groups around the country. For extremely practical folks that were already raising some type of stock, the purchase of llamas was due to their hardy nature, easy care and resale values. For me it's a little of all of these reasons as well as the incredable high I get each time a new cria enters this world. Few things in life are as soft or cute as a llama cria! LOOKING FOR A SPECIAL LLAMA? I gotta go to bed soon, so I can't say nearly everything I want to, but I want to at least get in one thing. We've owned a lot of llamas and bought most of them (ie, all but three). Of all the llamas we've brought home, Sneaky is far and away the most well-adjusted -- to people in general, and to his new surroundings. You should be bustin' your buttons over THAT, because that's a product of his upbringing more than anything else! Nothing makes me happier than to know my 'kids' are happy in their new homes and their new human buddies are happy too! I highly recommend Gwen's book for anyone with an interest in animals. throughout the thoroughly enjoyable tale. For trainers and animal lovers of all ages! WANT YOUR OWN WEB PAGES ? Llama spirit eggs, history and an evil curse. What Bored Castalia Llamas Do. A humorous look at my llama beginnings. A visitor meets her first llamas. Taylor's Tale, for my granddaughter. Women Who Move The Earth. Glow Test...do you know why? Wanna play in my tree? terrible things will happen to you.